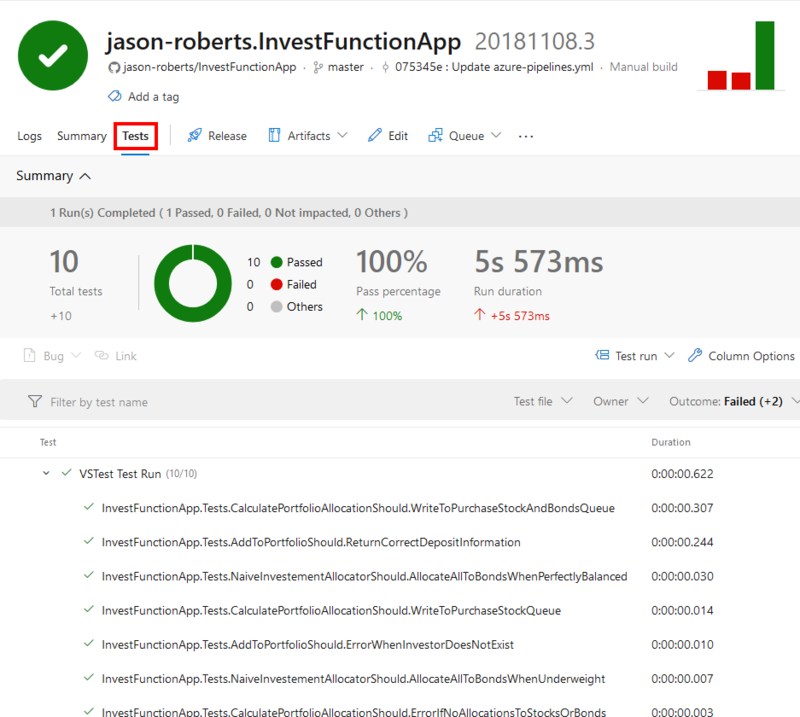 This is the fifth part in a series demonstrating how to setup continuous deployment of an Azure Functions App using Azure DevOps build and release pipelines. In the demo app solution there is a testing project. This project contains unit tests that can be run automatically as part of the build pipeline. Side note: In the preceding code, the CreateMockRequest method makes use of .NET streams, if you’re not familiar with streams or want to understand them better, check out my Working with Files and Streams in C# Pluralsight course. There are also CalculatePortfolioAllocationShould and NaiveInvestementAllocatorShould test classes. Recall from earlier in this series that we defined the build using a YAML file. There are a couple of steps that are related to unit tests. Notice in the preceding YAML that the test project being executed is “src/InvestFunctionApp/InvestFunctionApp.Tests” and the trx option is being specified to log test results into a Visual Studio Test Results File (TRX) format file. If the test(s) fail the build will fail and the release pipeline won’t execute and try and deploy a build with failing tests. Note that in this series we’re using xUnit.net as the testing framework and Moq as the mocking library but you could use MSTest or NUnit and a different mocking library if you wish. If you want to learn more about xUnit.net or Moq, check out my Pluralsight courses: Testing .NET Core Code with xUnit.net: Getting Started and Mocking in .NET Core Unit Tests with Moq: Getting Started. In the next part of this series, now that we have a build pipeline that will run tests and create artifacts, we can create a release pipeline to automatically deploy the app to production if the build succeeds.